The last few years have seen the concept of mindfulness gain rapid traction, from corporate board rooms to sports teams. At its core, it is a very simple philosophy that should apply to every walk of life. Therefore, the need for mindful eating shouldn’t really be a surprise if you really think about it. We’re sure most of us have grown up listening to parents scolding us for watching TV, reading comics, or talking while eating. I am sure you remember being told, “No distractions while eating!”. 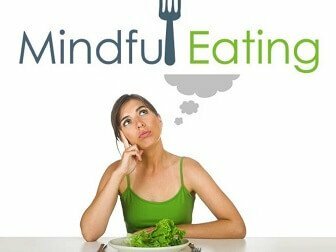 Without ever realizing it, that was an implicit order to practice mindful eating, something which we seem to have given up on in current times. Before we delve deeper into why mindfulness is as important while eating as it is for better productivity, let’s understand the essence of this ‘modern buzzword’. According to ancient Zen Philosophy, mindfulness is simply “presence” and it is probably the simplest form of meditation there is. It is about being immersed completely in the present moment and being fully aware of it. Unfortunately, we now seem to be always racing against time, with our minds full rather than being mindful. As we multi-task our way through life, pre-occupied by numerous thoughts and worrying about either the past or the future, focusing on just one thing at a time seems like a terrible waste of time. How wrong could we be? Several modern studies have brought to the fore the ‘mind & gut connection’ and the resultant benefits of simply focusing on eating. It is not difficult to understand why. Prevents overeating/binge eating: If you eat mindfully, you are more likely to avoid overeating as you are fully aware of the quantity of food you are putting in your month. In turn, this means you are more likely to listen to the “full” signal coming back from your tummy! (Have you ever wondered why we tend to end up eating a lot more than we normally would at parties? It’s all thanks to the divided attention!). If you want to lose weight or are conscious of gaining weight, you know how important it is to not overeat. Better digestion & absorption of nutrients: When we are fully focused on the food we eat,our salivary glands work better. This aids digestion enormously. Also, we tend to slow down the pace of eating – we eat more leisurely, chewing the food well and ensuring that the important first stage of the digestive process is completed properly in the mouth. By ‘breaking down’ the food in the mouth, we enable much better absorption of all nutrients. Greater satisfaction and fulfillment: The undivided attention on the food helps us truly enjoy and appreciate its look, feel, fragrance and flavours. Isn’t such sensory fulfillment a great source of joy? Mindful eating invariably translates to joyfulness! The important word is conscious ‘practise’, as this is a process of creating and reinforcing a habit while (in many cases) altering an existing habit. Many of you would be familiar with the principle of auto-suggestion while practicing meditation or breathing exercises in Yoga. We should follow something similar to becoming mindful: tell yourself to experience every step of the journey of the food from the plate to the stomach. Don’t just take in the food, take in the entire eating process and enjoy it, slowly, leisurely. Sit in a clutter-free dining area, whether it is at the dining table or on the floor. Avoid the bed or the couch while eating. Try to close your eyes and visualize the food on your plate before you start eating. In our Indian culture, people close their eyes and say a silent prayer and express their gratitude. The attitude of gratitude is a key ingredient to our happiness; besides, this entire process of calming our mind and visualizing the food stimulates our brain to prepare for the digestion process! Turn off the television, keep the reading material and mobile phones away. Whatsapp messages and Facebook can (and must) wait! Pause for a few seconds after each morsel/bite of food. Take smaller portions, chew well and eat slowly. For a sensuous, intimate and mindful connect with your food, eat with your hands, not the fork and spoon. So, there you go. 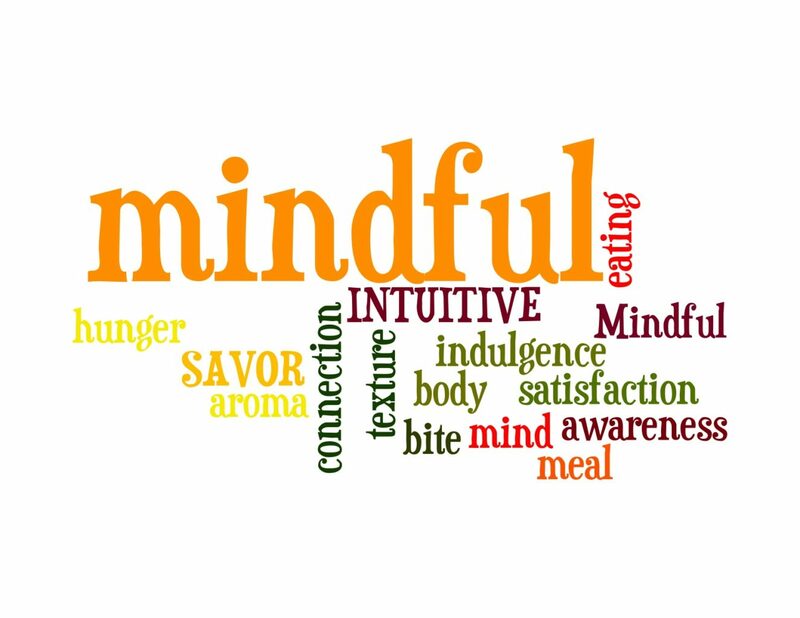 Mindful eating is not too difficult to practice, if you set your mind to it. Make a few simple changes to your eating routine and experience the true joy of eating. It’s an age-old wisdom that is rooted deep in Indian culture and philosophy, and let’s ensure we heed that wisdom to enjoy all its benefits! Keep yourself happy by keeping yourself healthy. Let well-known Mumbai dietitian and fitness expert Munmun Ganeriwal design a nutrition, exercise and lifestyle transformation program that elevates your overall sense of well-being. Contact us now for an in-depth consultation. According to the ancient Indian philosophy of Yoga, the ‘Annamaya kosha’ (our physical body) and our ‘Mana’ (mind) is a direct reflection of the ‘Anna’ (food) we eat. Fascinating new researchers agree with this ancient philosophy and is now telling us that what we eat, how we eat and at what time, all affect our body and brain, deciding not only how we look but also how well we can take decisions, execute plans, basically our cognitive performance. Getting their ‘diet’ right hence is crucial for Entrepreneurs to balance the risk/reward, flowchart growth, crack deals, meet deadlines, plan strategies and look presentable all at a time. “A good beginning makes a good ending”, says an Italian proverb. Starting off your day right is crucial for entrepreneurs as it will keep you high on energy and light on your feet all day. Most of us love to have our cup of tea/ coffee the first thing in the morning, almost like an everyday romance: fingers hugging the hot cup of fresh brew close to the lips, taking in each sip with all the aroma and warmth it offers. But sorry to burst your bubble, tea/ coffee is not the best drink as you wake up. Tea/ coffee, of any variety it may be, has caffeine in it. Studies suggest that caffeine triggers release of cortisol (also called ‘stress’ hormone). A big bump in cortisol puts your body in a ‘stress’ mode and slows down metabolism, breaks down muscle, hampers fat burning, increases blood pressure etc. This ‘stress rush’ is part of the reason why we feel ‘awake’ or ‘alert’ after our morning cuppa. While we sleep, all our body processes slow down. As we wake up, the body systems also need time to wake up and start functioning in its full capacity. In such situation, it is better to eat ‘real’ food that is easy on it v/s something that will further load or stress it out. Action Plan (1) – Start your day with a fruit/ dry fruits/ handful of nuts or hot homemade breakfast within half an hour of waking up. Post this meal, you can enjoy your morning cup of tea/ coffee. “If you fail to plan, you are planning to fail” said Benjamin Franklin. Everyone in business knows that planning helps prevent crisis so that you spend less time firefighting and stay ahead of the game. Similarly, if you do not want to be caught up in food crisis/ accidents (like gorging on a pastry at 6pm when you had just decided to eat healthier in the morning), you need to be planning ahead for your meals. Eating small, frequent meals every 2-3 hours gives a slow, sustained release of blood sugar which in turn keeps your mind alert and body energetic through the day without feeling the need for stimulants like tea/ coffee/ cigarettes. Action Plan (2) – Plan for your lunch and evening snack (between 4-6pm) in advance. For mid meals, nuts, dry fruits, chana, fruits, yoghurt, cheese slice, coconut water, nimbu sherbets are great options. Indian entrepreneurs, today are going global like never before. For an undying global spirit, what we must stay true to is eating local. Eating local and seasonal foods is good for your health, supports the local economy and benefits the environment at large. Whereas eating foods from far off places, industrialized and packaged, adds inches to your waist line, hampers work productivity and will negatively affect your bottom line. Action Plan (3) – Replace the cookies/ biscuits in meetings with peanuts/ cashews, aerated drinks/ colas with buttermilk/local sherbets, cakes/ pastries with chikki/ laddoo/ dates etc. Ever wondered what the traditional business communities (Marwaris/ Gujaratis/ Parsis/ Sindhis) of India eat in common? It’s the GHEE. Ghee being rich in omega 3 boosts brain power and improves memory and cognitive function. Its unique SCFA accelerates fat burning giving you a younger body and sharper mind. Action Plan (4) – Make sure you have at least 1 tsp of ghee or white butter each with breakfast/ lunch/ dinner. Eating a wholesome dinner that is not close to bedtime will allow enough time for digestion to occur, induce sound sleep and reduce the chance of waking up tired, bloated or acidic the next morning. In short, you would be all set to take the busy day head on! Action Plan (5) – Choose between dinner options like curd rice, rice & dal/ sambhar, khichdi, appam & stew etc and have it 2-3 hours before you go to bed. The founder of modern management, Peter Drucker, says- “Entrepreneurship is neither a science nor an art. It is a practice.” So much like ‘Eating Right’, a practise that only leads to good health and happiness! As professionals, we face a world of possibilities and challenges every day at the workplace, where our mental fitness is tried and tested, time and again. Surprisingly, when we think about the factors that help contribute to our daily performance and productivity at work, we probably would not give “food” much thought. Yet, age-old wisdom and modern research both point to the positive effects of a balanced diet on the way we think, feel and work. Wouldn’t you agree that anything that can improve your brain health and mental functioning capabilities is literally some serious “food for thought”? According to the teachings of Yoga, the ancient Indian philosophy, the ‘Annamaya kosha’ (our physical body) and our ‘Mana’ (mind) are a direct reflection of the ‘Anna’ (food) we eat. Modern research concurs with this ancient wisdom and is now telling us that what we eat, how we eat and when we eat, all affect our body and brain. Our diet influences not only how we look and feel but also our cognitive performance while taking decisions and executing plans, as this article in the Harvard Business Review points out. Similarly, an article published by the Mental Health Foundation indicates that food plays an important contributing role in the development, management and prevention of specific mental health problems such as depression, schizophrenia, attention deficit hyperactivity disorder (ADHD) and Alzheimer’s. The Foundation’s study showed that people who ate healthy foods on a daily basis had fewer mental health problems than those who preferred unhealthy foods (packaged food and takeaways). A balanced diet providing adequate amounts of carbohydrates, essential fats, amino acids, vitamins, minerals and water can contribute immensely to a balanced mood and feelings of wellbeing, the study asserts. To better appreciate the cause-and-effect relationship between food and our work performance, let’s understand the functioning of our brain in simple terms. The brain needs energy to perform its functions and be alert. This energy comes from conversion of the food we eat into glucose. When we do not eat well and allow the glucose levels to drop, our energy is drained which in turn affects our ability to focus. No wonder we often hear people say, “I cannot think on an empty stomach”. Unfortunately, this is often when one falls to the temptation of unhealthy, junk food. 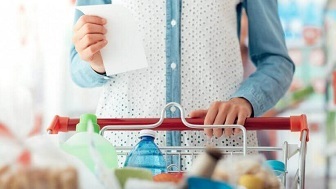 Despite intuitively knowing the difference between “good” and “bad” food, it is quite common to succumb to the lure of unhealthy food choices that seem more appetising, cheaper and convenient. Advance planning of what to eat and when is quite an effective strategy to keep both hunger and temptation at bay. Regular intake of small amounts of the right food ensures that the glucose levels are maintained and the brain is not deprived of the energy it needs. Importantly, it also prevents binge eating which happens when one gets too hungry. So, it is perfectly ok for “healthy snacking” such as some nuts (peanuts, cashews and channa) or a serving of fruit. Whether you are getting your lunch dabba delivered to your office or you prefer the spread of the office canteen, if you don’t watch how fast and how much you eat during lunch, the post-lunch session can be quite a drag. If you eat too much and/or eat too fast, then the digestion of food consumes a lot of energy instead of the energy being supplied to the brain for other work. Lethargy sets in and productivity takes a serious hit! You can imagine the consequences when you have important meetings or presentations immediately after lunch! Fruits and vegetables not only provide essential vitamins and minerals for our general well-being, but also are proven to contribute to some very desirable workplace attributes. A study by the British Psychological Society that monitored the food choices, consumption levels, mood, and behaviors of participants over a two week period found that people who ate fruits and vegetables were comparatively happier. This is because these provided a better supply of vital nutrients that fostered the production of dopamine, which plays a key role in the experience of curiosity, motivation, and engagement. As any professional working in an organization knows, these qualities are enormously valuable. The key is however to include locally grown fruits and vegetables as they have smaller food miles. The smaller the food miles, the better it is for your health! There’s a whole range of easy-to-obtain foods that provide the brain with a range of nutrients that will aid in keeping your energy and productivity levels high. Ghee being rich in omega 3 boosts brain power and improves memory and cognitive function. For optimal brain health, try to include at least 1 tsp of ghee each into your main meals. What we accomplish at work is a major contributor to our happiness and sense of well-being (or otherwise). Considering that we spend well over one-third of the day and have at least one major meal (for many in metros like Mumbai, it is two meals) at work, one can’t over-emphasize the need for healthy eating with a balanced diet at the workplace. The next time you pack your lunch dabba (or get somebody to do it for you), make sure that you are getting everything your brain and body need to whizz through the day, with energy, enthusiasm and clarity.